In 1916 a sugar company began diverting about 30 million gallons of stream water per day to its sugarcane plantation, to the detriment of downstream water users. When the plantation shut down in 1994, a long battle over the water began. Local residents were able to win back over half of the water, which benefitted the entire ecosystem. This paved the way for other stream restoration efforts. The Hawaiian Islands sit in the middle of the Pacific Ocean. Their mountains capture rain from the northeasterly tradewinds, and each island has a rainy “windward” side and a relatively dry “leeward” side. 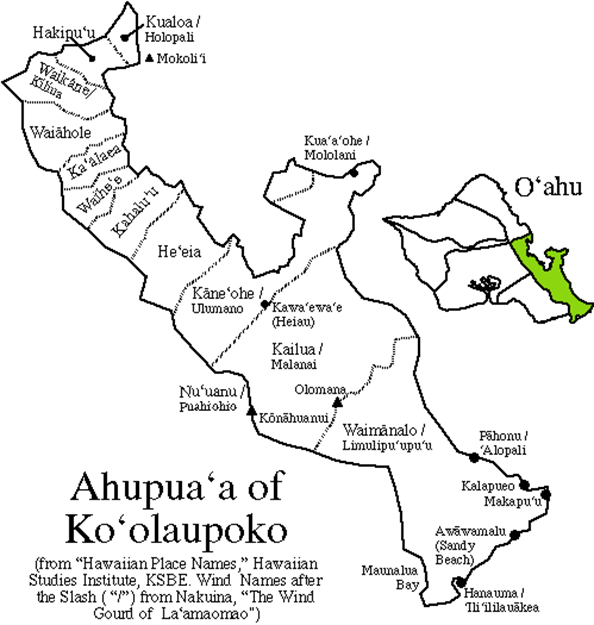 This story takes place on the island of O‘ahu, in the windward district called Ko‘olaupoko (see Figure 1). Note: Kahana is just north of this map. For well over a thousand years, the people of Hawai‘i lived in harmony with their ecosystem and were quite prosperous. The staple crop taro filled every valley, along with sweet potatoes, breadfruit, bananas, and coconuts. People raised pigs and chickens, and fish were plentiful in the streams, fishponds, and ocean. The land was divided into ahupua‘a (watersheds), and the water supply was from streams and springs. Each ahupua‘a had a konohiki (resource manager) to make sure things were running sustainably and equitably. The Pacific islands looked like sitting ducks to the colonizers that prowled the seas in the 18th century. Great Britain took over Fiji, New Zealand, and other islands; France took over Tahiti, New Caledonia, and others; the United States got Hawai‘i, Guam, and others. It happened like this: Captain Cook arrived in Hawai‘i in 1778. He named it the Sandwich Islands in honor of his sponsor, the Earl of Sandwich. Cook was followed by European and American missionaries and businessmen. Once sandalwood and whales were depleted in the early 1800s, the foreigners turned to plantation agriculture, primarily sugarcane but also pineapple. Sugar is known as the “hunger crop” because it has little nutritional value, needs a lot of water, and takes a long time to grow. Private land ownership was unheard of in the Pacific islands, but the foreigners said it was essential. Besides, after the British occupied Hawaii in February-July 1843, and France took Tahiti in 1844, the King was persuaded that an overthrow would result in a foreign power getting all the land of Hawai‘i. Thus in 1848 the Mahele (division of lands) took place. The King took some ahupua‘a as his personal property and divided the rest between the government and about 250 chiefs and konohiki. The maka‘ainana (common people, who lived on the land) were also allowed to claim title, but the process was so complicated and expensive that few did so. Many of the chiefly lands remain in “ali‘i trusts” but many fell into the hands of foreigners, some of whom accumulated vast “landed estates” (Kame‘eleihiwa 1992). In 1875 the Treaty of Reciprocity—a free trade agreement between the Hawaiian Kingdom and the United States—allowed the sugar growers to export sugar to the U.S. tariff-free. The number of sugar plantations increased rapidly, and by 1884 there were 90 sugar plantations in Hawai‘i. Nearly all of the plantations were owned by five companies, which branched out into plantation-related “factors” such as shipping, banking, insurance, merchandising, etc. and came to wield tremendous economic power. The sugar growers imported well over 300,000 foreign workers—Japanese, Chinese, Korean, and Filipino—which changed the islands’ population permanently. They built over 70 “ditches” (large irrigation systems) to water their crops, without considering or compensating existing water users (Kent 1993, Wilcox 1996, “Reciprocity Treaty” n.d.). When the Treaty of Reciprocity was renewed for another seven years, it gave the U.S. military exclusive use of Pearl Harbor, a foothold that eventually led to the U.S. military occupying about one quarter of O‘ahu’s land. “Appeasement of foreign desires was certainly a mistake,” says Kame‘eleihiwa (1992), “giving them an inch induced them to desire many miles, in fact, the entire four million acres of Hawai‘i.” Indeed, a group of American sugar growers and businessmen (with back-up from the U.S. military) overthrew Queen Liliu‘okalani in 1893. Things got worse as the new “Republic of Hawai‘i” sold off more public lands and ceded the entire nation to the U.S.
American businessman Lincoln McCandless, a prominent well driller, acquired hundreds of acres of land in Waiahole and Waikane Valleys. He sold his water rights to Oahu Sugar Company, whose subsidiary Waiahole Water Company (later Waiahole Irrigation Company) built the Waiahole Ditch in 1913-1916 (Windward Video 1976, Wilcox 1996). 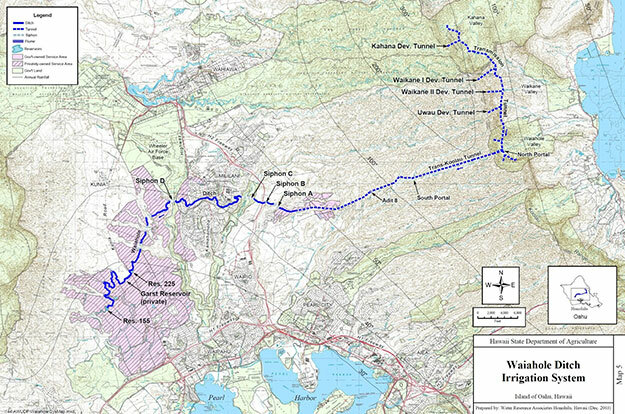 One of the most ambitious in Hawai‘i, the 25-mile-long ditch begins in Kahana and collects water from several windward watersheds (Kahana, Hakipu‘u, Waikane, and Waiahole) before going through the Ko‘olau Mountain Range to the leeward plains (see Figures 2 and 3). Tunnel workers were surprised when water came out from all sides because they had breached the mountain dike. Additional water collection tunnels were drilled into the mountain. Less surface water was taken directly, but the dikes feed the streams through seeps and springs, so the impact was similar. Residents who depended on streamflow in these watersheds were assured that their water would not be significantly affected, but that was not true. Within a short time, the flow of water in Waiahole stream went from 30 million gallons a day to three. Waikane stream went from seven million gallons a day to one and a half. More than two dozen windward streams completely dried up. At the time, the windward valleys were intensively utilized for growing taro and rice. Many residents were forced to give up their livelihood. And the people depending on their production of taro in these areas were forced to sacrifice their traditional foods. 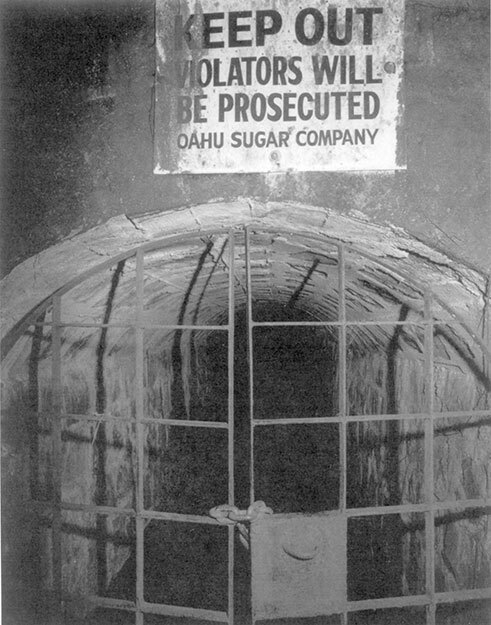 Oahu Sugar Company used 140 million gallons per day (mgd). Most of that was groundwater, but for 77 years the ditch transported about 30 mgd to the plantation. Why did those who lost their water not protest? Fighting for water rights is time-consuming and expensive, especially since the system switched from the konohiki to the courts. “Justice was not for the poor in water matters,” says Wilcox (1996). The population was about 50% Hawaiian, 20% Japanese, 17% Filipino, and 12% white (of course, many were of mixed race). This multi-ethnic group was determined to defend their country lifestyle. When McCandless’ daughter and heiress, Elizabeth Marks, sought to evict them to make way for a housing development in the early 1970s, they protested vigorously. They formed the Waiahole-Waikane Community Association (WWCA) and testified against rezoning at the Land Use Commission. A court challenge was unsuccessful, but WWCA and its many supporters held protests at a downtown bank, the Honolulu court house, city hall, the Governor’s mansion, the state capitol, the offices of developer Joe Pao, and the front lawn of Ms. Marks’ residence in Nu‘uanu (see Figure 5). They also had a petition drive and collected 20,000 signatures (Lasky 2014, Windward Video 1976, Ed Greevey photos at ulukau.org). On the day eviction notices were issued, the community gathered together and burned them all in a big pile (see video). 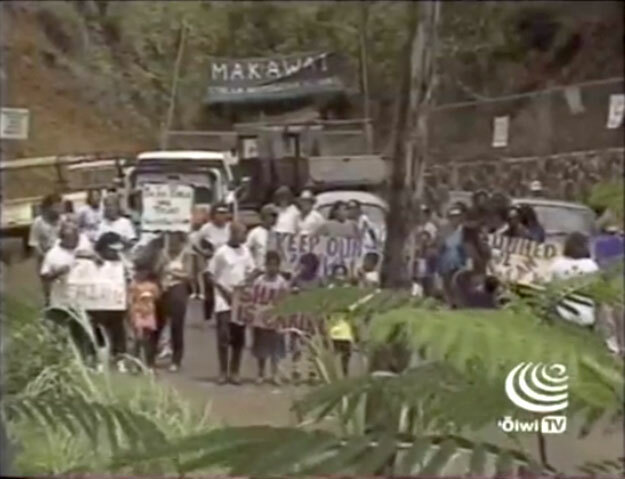 On January 4, 1977, the day evictions were to take place, WWCA—with supporters from around the island—blocked the highway for hours, until assured that no evictions would take place that day. A few days later the Governor announced that the state would purchase 600 acres for $6 million from Marks to create an “agricultural park” with long-term, low-cost leases for the tenants (Lasky 2014). Hawai‘i water law evolved favorably in the 1980s. Water was defined as a public trust resource. No one can own it nor buy and sell it. People can use water, but only for “reasonable and beneficial” uses. Water managers also realized the value of instream uses and the importance of estuaries; freshwater flowing into the ocean was no longer considered “wasting.” Traditional and customary Hawaiian water rights, including taro farming, were also increasingly recognized. In December 1993, three small organizations — the Waiahole-Waikane Community Association, the Hakipu`u Ohana, and the Kahalu`u Neighborhood Board — petitioned the state Commission on Water Resource Management to restore the flows to windward O`ahu streams by ending the diversion of water through the Waiahole ditch. The stream restoration called for by the “windward parties” was to restore native stream life, protect Native Hawaiian gathering rights, support the productivity of the estuary, and preserve traditional small family farming, including taro farming (Earthjustice 2000). In 1994, Oahu Sugar Company was caught dumping Waiahole Ditch water into dry leeward gulches. Wasting is not allowed under Hawai‘i water law. The CWRM accepted a six-month agreement negotiated among the parties to reduce Waiahole Ditch diversions from 27 mgd to just 8 (Pa Martin et al. 1996, Miike 2004). The rest of the water was returned to Waiahole Stream on December 24, 1994 (Na Maka 1996). The benefits were soon apparent. 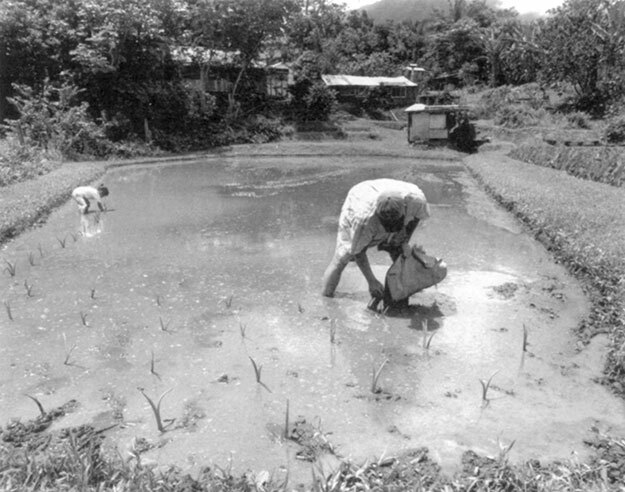 Taro requires a constant flow of cool water, and taro farmers were able to open new fields, including a community taro patch called the Mauka Lo‘i (see Figure 6). Native stream fishes such as o‘opu (goby) and ‘opae (shrimp) were found in greater abundance. Some of these species are rare or endangered; one goby (Lentipes concolor) was previously thought to be extinct on O‘ahu. The swifter streamflow also flushed out non-native species along with their parasites. In the estuary, fishers reported more aholehole (mountain bass or Hawaiian flagtail, after which Waiahole was named) and mullet. All these fishes depend on the connection between streams and the ocean. O‘opu and ‘opae are born in the stream and their larvae are swept down to the ocean, where they spend 3-6 months before returning upstream. Aholehole and mullet spend most of their lives in the ocean, but swim into streams for food and shelter. Endangered waterbirds such as the Hawaiian moorhen (koloa), as well as damselflies, also benefited from the increased water flow (Tummons 1996, Dudoit 1997, “Rough Water Ahead” 1997). In the 1970s land struggle, the Waiahole-Waikane Community Association earned the nickname ke kalo pa‘a o Waiahole (the hard taro of Waiahole) for being obstinate in the face of bad intentions (Lee 1997, Sproat 2014). In the 1990s they were equally so. When the six-month agreement to return all but 8 mgd was due to expire in June 1995, they successfully blocked crews from reaching the water gate (see Figure 7). An injunction was issued to remove the protesters, but two days later the Ditch company announced it would not increase flow in the ditch, and the following week the CWRM directed that the flow be limited to 9.4 mgd until a final decision was made (Tummons 2000). On November 9, 1995 the very complicated Waiahole Ditch Combined Contested Case Hearing officially began at the CWRM with 25 parties, to decide on (a) water use permit applications, (b) petitions for interim instream flow standard amendments, and (c) petitions for water reservations (Miike 2004). The three community organizations were joined by sovereignty group Ka Lahui Hawai‘i. Other windward parties included the Department of Hawaiian Homelands and the Office of Hawaiian Affairs. Two commissioners had to recuse themselves due to conflicts of interest (i.e., ties to the landed estates), and with four remaining, the CWRM barely had a quorum. Testimony and presentation of evidence went on until August 1996, with 52 hearing days (including four evening sessions), 161 witnesses, and 567 exhibits. The largest group of witnesses—47—spoke in favor of the WWCA’s new instream flow standards. Diversified agriculture had indeed sprung up on former sugarcane land after 1995, with two relatively large farms (Sugarland and Aloun) and many small farms growing a variety of vegetables for local consumption (in addition to Dole and Del Monte’s existing pineapple operations). Given the relatively short-term leases to small farmers (15 years), there is suspicion that the landed estates are really interested in the more lucrative urbanization and tourism (Dudoit 1997). In 1997 the CWRM decided that, of the 31.07 mgd requested by the leeward parties, 11.93 were granted—10.64 for diversified agriculture and 1.29 mgd for other uses (a prison, a cemetery, and three golf courses) (CWRM 1997). Hawai‘i’s Attorney General, who had chosen to represent the state Department of Agriculture in its petition to reserve all the Waiahole Ditch water for diversified agriculture, objected to the decision and fired the Deputy Attorney General who had been serving with CWRM for 17 years. The windward parties objected to the decision because it restored only 6 mgd to two streams (CWRM 1997, Tummons 2000, Earthjustice 2000). As mentioned above, fighting for water rights is time-consuming and expensive. What was originally thought to be a six-month process went on for 15 years. The Water Commission’s decisions were appealed all the way to the Hawai‘i Supreme Court twice, and twice the Supreme Court vacated the Commission’s decision and ordered it to reconsider. The windward community organizations were able to raise $55,000 with concerts and other fundraisers, and enlisted the help of Earthjustice, which as of early 1997 had waived $840,000 in legal fees (“Rough Water Ahead” 1997). In the CWRM’s third Decision & Order (CWRM 2006), the leeward allocations were 12.57 mgd; windward parties were allocated 12 mgd to achieve their new interim instream flow standards; and the remaining 2.43 mgd of unpermitted water, as well as any unused permitted water, was to flow in the streams as well (see Figure 8). Compared to the low flows of the 1960s, the Commission estimated that Waiahole Stream flow increased by 124%, Waianu by 600%, Waikane by 150%, and Kahana by 19%. 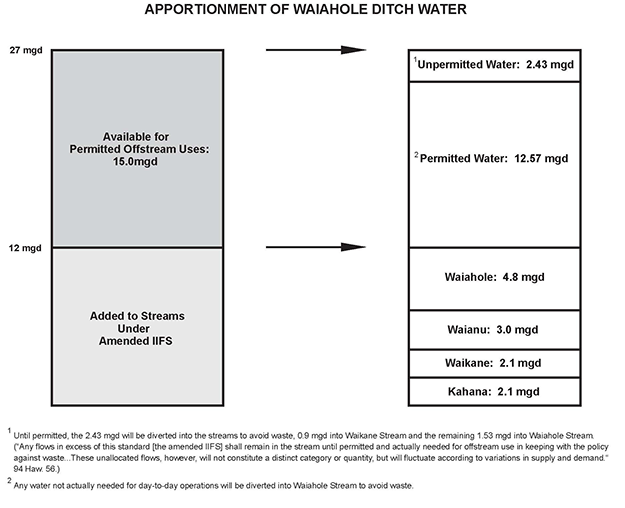 Note: Waianu is a tributary to Waiahole Stream. In response to even more appeals, in 2010 the Intermediate Court of Appeals (also plagued with recusals) upheld the 2006 decision, except the allocation of 0.75 mgd to the defunct Pu‘u Makakilo Golf Course (ICA 2010). This amount was added to the unpermitted water that flows in Waiahole and Waikane Streams. Thus the windward streams got slightly over 15 mgd of their water back, plus any water not actually needed for day-to-day operations on the leeward side. Famous taro farmer Charlie Reppun is pleased with the outcome. The increase was indeed substantial, he says. All his fields are flooded, whereas before he had to rotate among them. Especially beneficial for growing taro is the decrease in water temperature. Plus, his water wheel produces electricity more consistently. Equally important is the benefit to fish in the stream and estuary (pers. comm. 5/17/18). In a recent episode of Waltah the Worm, a children’s television show, Waltah learned the connection between Waiahole Ditch and “triple rich”—people, place, and water equals prosperity. Although it was far from complete restoration of the windward streams, as the windward parties wanted, the Waiahole Ditch case “marked the first such restoration of water by plantation interests in Hawai‘i’s history” and was a “beacon of hope” for other Hawaiian communities. Earthjustice went on to successfully tackle a very similar situation on the island of Maui—Na Wai ‘Eha, the four waters of Waihe‘e, Waiehu, ‘Iao, and Waikapu (Knoblauch 2014, Sproat 2014). the importance of multigenerational and extended family networks. Another essential ingredient was legal representation by Earthjustice. This, too, is a form of people power, because Earthjustice is a “nonprofit, public interest organization that does not charge its clients a fee and instead relies on non-corporate donations” (Paul Achitoff, pers. comm. 6/27/18). Some of the EcoTipping Points Ingredients for Success are similar to those in Lasky’s list above. Shared community awareness and commitment. Community organizing was a key in both the land and water struggles. Outside stimulation and facilitation. The actions were chiefly in response to outside factors. Earthjustice facilitated the water victory. Enduring commitment of local leadership. Strong leadership mobilized the community and endured for decades. Co-adaption between social system and ecosystem. When the water was taken away less taro was grown, and when the water was returned, more taro was grown. By working together to protect the land and water, the community was able to preserve its country lifestyle and restore the ecosystem. Letting nature do the work. The stream restoration led to a cascade of benefits. Social and ecological diversity. The population was diverse, and the ecosystem they protected spanned from the mountain to the sea. Social and ecological memory. Social memory goes back to an old legend about a man who was particularly obstinate in the face of bad intentions. In retaining its memory, the ecosystem was able to rebound quickly. Building resilience. “Keep the country country” bumper stickers can be seen all over O‘ahu. This broader movement is ready to protest all sorts of development in the island’s rural areas. Dudoit, D. Mahealani. 1997. Reservoir of Hope. Manoa 9(1), p. 161-163. Kame‘eleihiwa, Lilikala. 1992. Native Land and Foreign Desires – Pehea La E Pono Ai? Honolulu: Bishop Museum. Kent, Noel J. 1993. Hawaii: Islands Under the Influence. Honolulu: University of Hawai‘i Press. Knoblauch, Jessica. 2014. Ripple Effect. Earthjustice Quarterly Magazine, Winter, p. 26-30. Lasky, Jacqueline. 2014. Waiahole-Waikane. Chapter 1 in A Nation Rising: Hawaiian Movements for Life, Land, and Sovereignty, edited by Noelani Goodyear-Ka‘opua, Ikaika Hussey, and Erin Kahunawaika‘ala Wright. Durham: Duke University Press. Lee, Vivien (with photos from Piliamo‘o). 1997. Ho‘i ka Wai: The Waiahole Stream Restoration. Manoa 9(1), p. 119-136. Miike, Lawrence. 2004. The Waiahole Ditch Controversy. Chapter 6 in Water and the Law in Hawai‘i by Lawrence Miike. Honolulu: University of Hawai‘i Press. Pa Martin, Elizabeth. David Martin, David Penn, and Joyce McCarty. 1996. Cultures In Conflict In Hawai'i: The Law and Politics of Native Hawaiian Water Rights. Hawaii Law Review 18(71). Rough Water Ahead – The Waiahole Ditch Controversy. 1997. Honolulu Star-Bulletin, April 25, p. A-1. Sproat, D. Kapua‘ala. 2014. A Question of Wai: Seeking justice through law for Hawai‘i’s streams and communities. Chapter 9 in A Nation Rising: Hawaiian Movements for Life, Land, and Sovereignty, edited by Noelani Goodyear-Ka‘opua, Ikaika Hussey, and Erin Kahunawaika‘ala Wright. Durham: Duke University Press. Wilcox, Carol. 1996. Sugar Water: Hawaii’s Plantation Ditches. Honolulu: University of Hawai‘i Press.